And now to the finish line! We are delighted to introduce the Saturday headliner, the one and only German veterans MORGOTH, pioneers of the death metal genre, who need little further exposition. 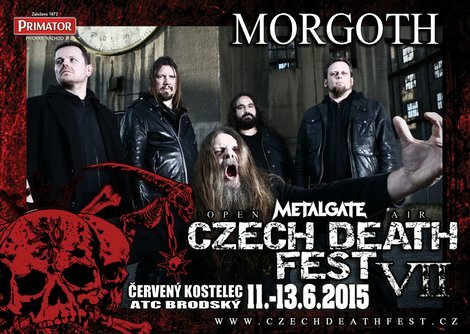 Last year, you could see MORGOTH on Obscene Extreme Fest in Trutnov. This year, they are back on the warpath, taking European stages (including Blastfest in Norway, Copenhell in Denmark, Hellfest in France, or Protzen, Wacken and Summer Breeze in Germany) by storm, and we are honored that MORGOTH will include MetalGate Czech Death Fest in their march. Recently, there was a change in the band’s line-up, whereby the longtime vocalist Marc Grepe left MORGOTH and the vacant post was filled by Karsten “Jagger” Jäger from Disbelief. MORGOTH is also currently working on their new album “Ungod”, which will be released in spring 2015 by Century Media. This year also marks the 30th anniversary of the band, which means you are in for a treat as the band shall have a special performance to celebrate this occasion in store for you.